What’s up Colts Nation!? I’m back for another rendition of my fantasy blog. Last week was a bitter sweet one for me and my fantasy team. I was so excited to finally see the return of Ryan Mathews who was a second round pick of mine that had high expectations. He had missed the first few weeks which cause me to have to juggle running backs none of which helped lead me to victories. Sitting at 0-2, with word that Mathews was coming back provided some optimism. Unfortunately he didn’t get the opportunities I was hoping and ended up scoring me a mere 5.6 points. Another downfall of mine was at the quarterback position. 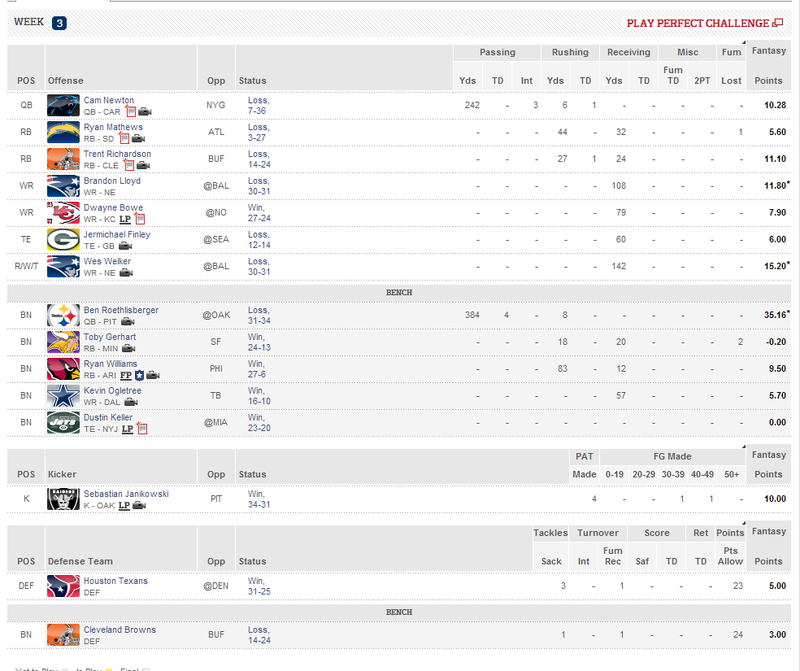 As you can see below, I started Cam Newton and had Ben Roethlisberger on the bench. Newton went for 10.28 points and Roethlisberger went for 35.16. A 20 point swing that would have given me my first win of the season. This week I’m matched up against the only other winless team in my league. I have a few key moves that give me good chances. I’m starting Ryan Wilson (Arizona RB) as he will be the starting back getting a high number of carries against Miami. Week 4 Start em: I’m going with the abovementioned Wilson. I think that he’ll be workhorse for the Cardinals against the Dolphins. He’s a strong powerful runner that will cause problems for the Miami defense. Week 4 Sit em: Sam Bradford against the Seattle pass rush. These guys and their bright uniforms have 10 sacks on the season already, and they’ll get pressure on the Rams quarterback. Week 4 Random Though: If you have any offensive player for the Green Bay Packers START THEM! They face a reeling New Orleans team at home that has struggle against the pass and should have a high level of energy coming off that Monday night loss. For from me visit my homepage and watch my tailgate videos! Your blog postings are very funny. Why? Because it’s hilarious that your fantasy team is winless and yet you are offering us start/sit em tips. Riiiiight. The aforementioned Ryan Williams had 26 yards!